This is a great vest to start your cross training, strength training, and anything else you will need a weight vest for. The vest is one size fits most. The weights comes included. It also comes with a one manufactures warranty that covers the vest. This product is vest only, not include any weight. 【Material】 Made of high-density thickening oxford fabric, durable to use. 【Highly Flexible】Highly flexible compressed sponge interlining, for protection and shock absorption. 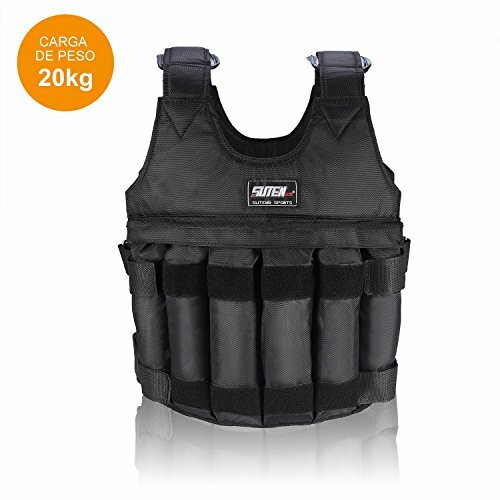 【Include】The Weighted Vest With 16pcs pouches for loading sand or steel plate(NOT included 44LB/ 20KG steel plate or 22LB/ 10KG sand). 【Length】60cm / 23.6in ; Width: 42cm / 16.5in ; Max loading: 20kg (when loading steel plate), 10kg (when loading sand).